I want an invite to this wedding: Couple Re-Creates Famous Movie Posters for Engagement Pictures. This article is interesting: Why Americans Fetishize Paris. I think a lot of it is quite true, but…I still love Paris just the same. File this under “cover songs you never thought you needed to hear but that, upon listening, are actually kind of awesome”: Prince covers Shania Twain’s You’re Still the One. How to Dance Properly to “Get Lucky.” So true. Also, Soul Train was kind of amazing, right?! Ohio Was Settled by Hitlers. Don’t you think this just explains so much about Ohio? This story is completely adorable – a couple born on the same day, who were married for 75 years, died just one day apart. I marathon-watched Orange Is the New Black a few weeks ago (great show, BTW – watch it), so I love this prison rules supercut. Really, really want to see this movie: The Secret Life of Walter Mitty. 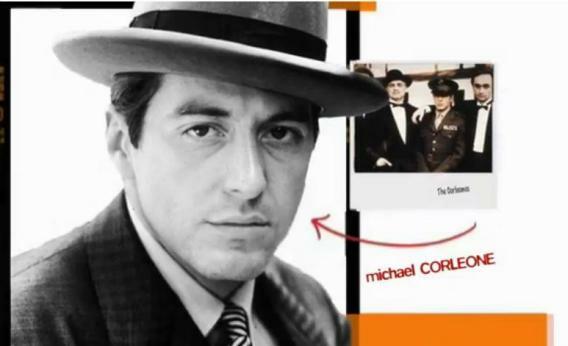 When two brilliant things collide: Arrested Godfather. I love this story on Michigan’s oldest living alum.